The predominant artistic style in France toward the end of the eighteenth century was Neoclassicism. Influenced by a rediscovery of the art of the ancient world, artists invoked the ancient classical world in service of contemporary ideas or events. In contrast to the frivolously decorative Rococo art that had preceded it, Neoclassicism was variously didactic, serious, monumental and quietly grand. Works were commissioned and painted with great attention to detail. During the Revolutionary period the Academy system of the ancien régime, which had controlled the education of artists and the display of art works, was abolished by the National Assembly in 1793. The Assembly declared that all artists should be allowed to exhibit in the Salon – the annual Academy exhibition – and that entry to the exhibition should be free. Under the National Convention, arts were seen as essential in the development of a new society for their instructive and inspirational value. The French Revolution and the philosophical thought that underpinned it also inspired artists and writers to look beyond science and reason to the power of nature and the emotional and spiritual forces of existence. Romanticism – art that emphasised the expression of personal creativity and experience – arose at this time as a counterpoint to the analytical rationalism of Classicism – the invocation of the ancient classical past (termed Neoclassicism). Artists, many of whom had lost their previous patrons, had to be wary of expressing counter-revolutionary sentiment. The fortunes of many artists rose and fell with the political tides. Taste had long dictated that history painting had enjoyed a higher status than landscape, portrait and genre painting – realistically depicted scenes from everyday life. After the years of the Terror, relative peace followed under the Directory which dictated a greater restraint and elegance in artistic production. This gradually gave way under the Consular and then Empire periods to a resurgence of spectacle and splendour in the arts. The nation called for images to celebrate its liberty, strength and grandeur. The new class of wealthy citizens created by the Revolution sought images of themselves and their world, establishing themselves as major consumers of interior decoration, furniture, decorative arts, sculpture and painting. Also in demand were images that represented contemporary events, that showed scenes from the exotic places visited by the armies of Napoleon, and landscapes imbued with the forces of nature. Art plundered from the various nations conquered and annexed by the Revolutionary army filled the palace of the Louvre (later renamed the Musée Napoléon under the directorship of Dominique-Vivant Denon). Paris became a showcase for art and Napoleon’s taste and power were highly visible. 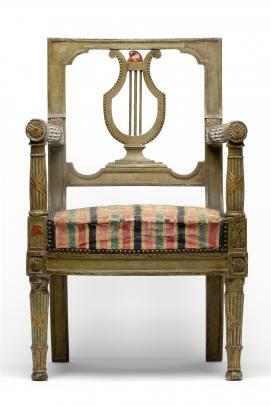 Above: This model of an armchair, made during the time of the National Convention in France, uses numerous symbols of the Revolution: the red Phrygian cap, the fasces, the tricolour-striped fabric and the lyre – a symbol of harmony, wisdom and moderation. 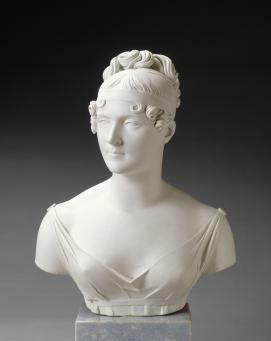 Neoclassicism looked to ancient Greek and Roman culture for inspiration. 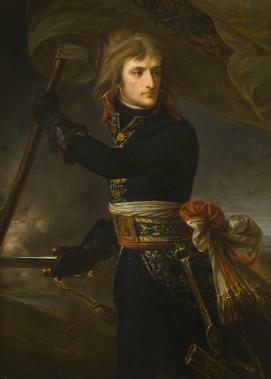 Choose examples of Neoclassical art in the exhibition Napoleon: Revolution to Empire and find out how they reference Greek and Roman figures, stories ideas and objects. Why would these be relevant in Napoleon’s time? How did the character of Neoclassical art reflect the mood of the times? Find an example of Neoclassical art and an example of Rococo art or art from the old regime in France. Compare the style and mood of the works. Find out more about Romanticism as an art movement. What values did it express and what were its visual characteristics?